It’s time once again for the Where In The Universe Challenge. Hard to believe we’ve done thirty of these already, and our readers are getting really good at this. The goal of the WITU challenge is to test your skills and visual knowledge of our universe. Guess where this image is from, and give yourself extra points if you can guess which spacecraft is responsible for the image. Mull over the image, make your guess and post a comment if you’re brave enough. Check back tomorrow at this same post to find the answer and see how you did. Good luck! UPDATE (11/20): The answer has now been posted below. If you haven’t made your guess yet, no peeking before you do!! Again, nice job everyone! Yes, this is the surface of Venus, taken by the Venera 9 lander before it quickly succumbed to the heat and pressure of the planet. From June to October 1975, the Russian space probe Venera 9 became the first craft to orbit, land on, and photograph Venus. Venera 9 consisted of two main parts that separated in orbit, an orbiter and a lander. The 5,070-pound (2,300-kilogram) orbiter relayed communication and photographed the planet in ultraviolet light. 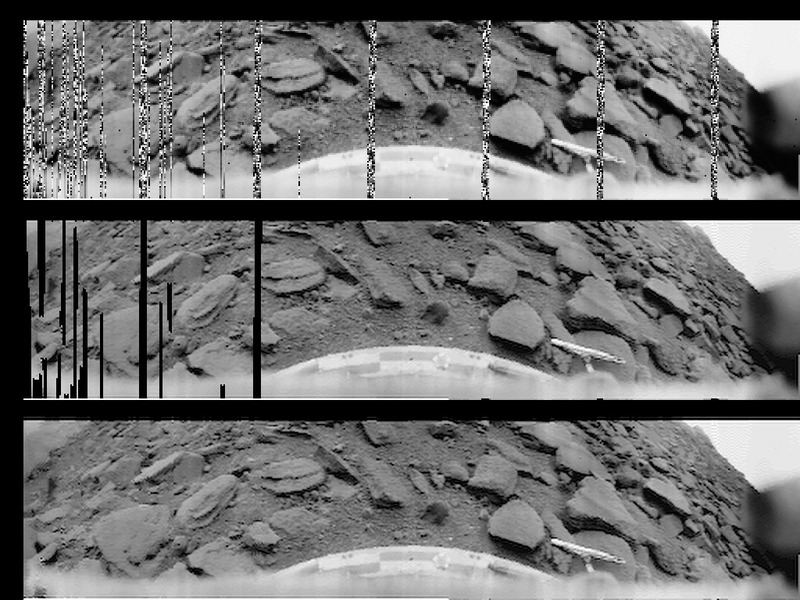 The lander entered the Venusian atmosphere using a series of parachutes and employed a special panoramic photometer to produce 180-degree panoramic photos of the surface of the planet. Great job! Come back again for next week’s WITU Challenge. Are all the rocks flat on top due to the surface pressure? Venus surface picture from russian probe Venera. My guess would have been: Titan/Huygens. Although I knew I had seen this picture within the last few months (APOD, probably) and knew that this was a place where I don’t visualise rocks. Anyway, I couldn’t come up with anything better than Titan and Huygens. Venus and one of the successful Venera probes. A couple of years ago somewhere on the web I saw the pre-processed images from Soviet originals – most of the ones I’ve seen throughout my childhood in 80s were copies of copies of copies and they looked really bad. Indeed the NASA page has the much better looking copy. Venus. one of the surface landers, I think one of the Venera probes. I’ll look it up in a minute – but I knew where right away. I thought that it was Venus, so I’ m glad to read that it really is. Does anyone have the color copy of this image or a similar one on the surface of Venus? It wasnt a color photo but they added realistic color afterward and the sky is like bright yellow or something, its a cool looking shot. Yeah, it’s Venus. This photo is iconic. Incredible feat by the Russians to accomplish this. My guess is Mars. Taken by Mars Pathfinder. Hmmm. Now to look at the other answers. My vote= Venus–circa 1970’s–from a Soviet-era-probe that crash landed. My guess was Viking on Mars, but I couldn’t understand the lack of horizon. Unless I’m very much mistaken, this is a photo of the surface of Venus, shot by one of the soviet Venera landers. Don’t know which one, but it was perhaps the 6th or 7th. Not too hard this time. Venus, and one of the early Russian probes. That’s Pluto from the ethiopian spacecraft. That’s right, the ehtiopian’s created the first spacecraft to make it Pluto. Its Venus picture taken from a russian craft. Don’t remember the name. I know it melted within 30 minutes. Venus (venera), it’s an image that really stuck in my mind as a child, I was so fasinated by it at the time, and still am. It’s one planet I wish we could see more of. Btw the venera program was the first to transmit photos from the surface of another planet and I think that’s why when they came out I was just blown away to see them. This is one of the few pictures of the surface of Venus. Once you’ve seen it, you’re never able to forget it. The fact there are so few pictures was due to the fact that the landing probe only resisted the heat on the surface for few moments. Venus, I think, with one of the Russian probes. That’s the surface of Venus, as shot by one of the Soviet Union’s successful Venera probes. I saw this for the first time I think in the mid-1970s, in the newspaper, and then numerous times after that, in scientific periodicals, astronomy texts, and on the Internet. It’s a shame nobody’s followed up on the Soviet series of Venus probes and landers; today we could probably build an even ruggeder lander, one that could survive several hours on Venus’s surface, sample the chemistry of the soil, and acquire other data that would be invaluable for planetary science and studies of the Solar System and its origins. Something to shoot for in the future. Definitely Venus Russian probe Venera. Looks like Venera Meadows on Venus. Definitely Venus, in future the probes can land in the North or South poles or at the cooler areas at dusk or dawn areas. Yes, it be Venus. Color would be useless, it is rather monochromatic. Just color it in grayish-yellows. Landing on Venus and getting pictures is about the hardest thing that has been done in this solar system!!! I believe it is Venus, with the rocks and all, which I have seen before. Probably Venera, I don’t know of other spacecraft that landed on Venus. i know that it is not Mars…And such rocky structures are limited…So probably Venus or maybe even our Moon…..
It’s Venus, I know this photo from grade school. It was taken in the 70’s by a Russian lander, but I don’t recall which one. This is Martian surface taken by Nasa probe. I guessed Venus – before I looked at any comments. I looks as hot as Hell there the way the stones are. NEPTUNE FOR SURE, EARLY CHINESE PROBE! Is Venera #14 in Venus. Venus taken by one of the Venera landers. Since there were 8 Venera probes launched and designed to land on Venus, I think you should at least say which one to get credit! Subtract points for giving additional information which is false. For example, Venera 9 actually landed on Oct 22, 1975 and transmitted the picture the same day. Oct 20th is actually the day the lander separated from the orbiter section, 2 days later the lander was inserted into the atmosphere. The first image ever taken of and from the surface of another planet. Venera 9, 1975. It stands out from all the other few Venus surface images (all taken by the Soviets, the last being 1982) in having so many rocks around the landing site. The rest are molten slabs. Venus is a fascinating planet nearly the size of Earth. We need to explore it more. We need more surface images from the surface. We need seismology and weather stations there. Mars gets too much attention. Time to aim sunward. We are on the surface of Venus with Venera 9 the 22 october 1975. With the new technology we have, can we land a robot on Venus and not have the same affects that the Venera 9 had? I’ve heard that we will probably send something that will fly through the atmosphere, but what about something that can land on the planet?